Add all ingredients in a large pot, pour over enough water or broth to cover by 1″. Bring to a boil, then cover and reduce to a simmer. Cook until peas are tender, about an hour. As long as you cook on low with a lid, it is difficult to overcook this. When peas are tender, the soup will be a bit chunky – you can blend with an immersion blender or regular blender to a consistency of your liking. Season to taste with salt, pepper and garlic powder – or any other seasoning you like. Serve with shredded cheese, sliced green onions, chopped ham or bacon… it’s very versatile. You can substitute 16 oz frozen cauliflower. You can also pour everything in a slow cooker and cook on low for 6-8 hours. I like to add a bay leaf, dried thyme (1+ tsp), and a pinch of cayenne while cooking – these are the seasonings used at Pea Soup Andersen’s. I don’t usually salt & pepper while cooking – some folks don’t want salt & my daughter Alycia does not like pepper. I like smoked salt & fresh-ground pepper on mine. If the soup is too thick, add water or broth. This recipe was passed along to me years ago by a friend at work. I have also been given a new starter by my daughter, Marissa Davis Hefner, after mine expired in the refrigerator from neglect. This is a sourdough starter and can be used for other sourdough recipes also. Mix flour & sugar. Stir in milk. Pour into a gallon zipper bag several times. Do not refrigerate. When air gets in the bag, let it out – this will also allow new yeast spores to get in. It is normal for the batter to thicken, bubble and ferment – this is what we want it to do. Day 2 – Squeeze the bag several times. Day 3 – Squeeze the bag several times. Day 4 – Squeeze the bag several times. Day 5 – Squeeze the bag several times. Day 6 – Feed the starter: add 1 cup flour, 1 cup sugar, and 1 cup milk. Squeeze the bag several times to combine. Day 7 – Squeeze the bag several times. Day 8 – Squeeze the bag several times. Day 9 – Squeeze the bag several times. Day 10 – Pour the batter into a large non-metal bowl. Add 1 cup flour, 1 cup sugar, and 1 cup milk. Pour 1 cup starter each into 4 gallon zipper bags. Keep one for yourself and give three starters with instructions to friends. Use the remaining batter to make Amish Friendship Bread. After fermenting for 10 days, you can freeze this starter for later use. Frozen starter will take at least 3 hours at room temperature to thaw before using. Combine avocado & ranch dressing. Set aside. Heat oil in a large skillet over medium heat. Add chicken, sprinkle with taco seasoning, and cook until done. Add salt, green onion, jalapeno, corn, cilantro, beans and spinach. Cook for about 3 minutes. Remove from heat, stir in cheese. Set aside to cool for about 10 minutes. Set egg roll wrapper in front of you, with the corner pointing towards you. Spoon about 2 Tbsp filling onto the center of each egg roll wrapper. Fold bottom corner up, then each side. Use your finger or pastry brush to lightly dab water onto the top corner, then finish rolling up. Preheat 4-6 cups of oil to 375 degrees. Deep fry the egg rolls in the hot oil for 3-5 minutes (or until golden brown) and remove to paper towels or a rack to drain for about 2 minutes. This recipe is similar to Chili’s egg rolls, which are a family favorite. I prefer egg roll wrappers, but feel free to use flour tortillas instead; just remember to increase the frying time. Filling is also good for enchiladas or an enchilada casserole, layered with corn tortillas and green enchilada sauce. You can double, triple (or more) and store for later use. Depending on how spicy you and your family like your dishes, use as little or as much as you want. In a large bowl, beat eggs; whisk in milk, 1 cup cheese, salt, mustard and paprika. Saute onions until tender, add spinach and ham, cook a few minutes longer. Let cool. Sprinkle 1/4 cup of cheese onto each pie shell, bake for 5 minutes, or until cheese is melted. Combine egg mixture with onion mixture, pour into pie shells. Bake at 400 degrees F for 25 minutes or until a knife inserted halfway between the center and the edge comes out clean. This can also be made in muffin cups with no crust. Place potatoes and onions in large pot. Cover with water. Boil until potatoes are tender. Add remaining ingredients. Cook until corn is done and soup is heated through. You can thicken the soup with cornstarch if desired – I don’t think this is needed. You may want more or less chile depending on your palate and the heat of the chiles you are using. Place onion & chiles in crockpot. Coat meat with seasoning. Place in crockpot. Pour water or broth around the meat. Cook on low for 8-10 hours or high for 4-5 hours. 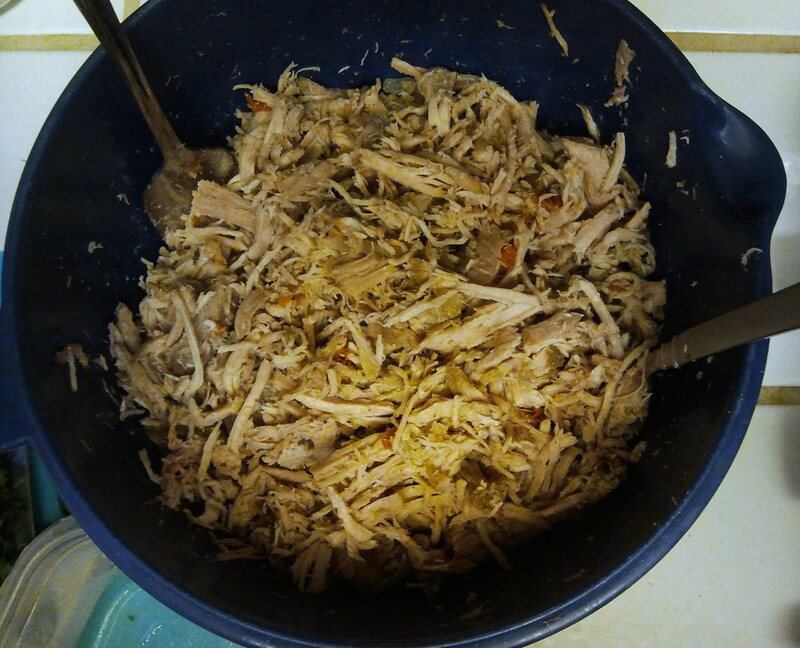 Shred pork & mix with onions & chiles. Serve on flour or corn tortillas with salsa, diced onions, fresh cilantro, sour cream and a squeeze of lime juice. Marissa likes to add a few splashes of liquid smoke – I have not tried this. This batch makes enough to season 8 pounds of pork roast. You can double, triple (or more) and store for later use. Marissa tripled all of the ingredients, except the cinnamon and left out the bay leaf from Erin’s recipe. I decreased the amount of salt. My daughter, Marissa Davis Hefner, found this recipe for us & my daughter, Alycia Davis has modified it slightly. Crust: combine pecans, brown sugar, and chocolate. Stir with a fork, then drizzle in Kahlua, stirring until combined. Press mixture into a pie pan, bringing it up the sides a bit. Do not bake. Set aside or refrigerate until needed. In small microwave safe bowl, melt 3 ounces of unsweetened baking chocolate until stirable (about 45 seconds on high). Set aside to cool. Beat butter, sugar, instant coffee, and Kahlua until fluffy, about 1 ½ minutes. When melted chocolate is cooled, drizzle it into the butter/sugar mixture as it beats on medium speed. Add vanilla. Beat the mixture thoroughly until combined, scraping the sides if necessary. On medium speed, add the eggs, one at a time, beating about 5 minutes after each egg.The sugar should be completely dissolved – no granules left. Pour filling into the pie crust. For a nuttier flavor, we decided to toast the pecans. For a stronger mocha flavor, we increased the instant coffee granules (and changed to espresso powder) and Kahlua in the filling. In a small bowl, mix vinegar, oil, salt, sugar, black pepper, cumin, chili powder. In a medium bowl, stir together beans, corn, onion and cilantro. Toss with vinegar and oil dressing. Cover, and refrigerate overnight. Garnish with cilantro. Excellent as a dip with tortilla chips, also.